Scripture does not speak at all about Halloween, but it does give us some principles on which we can make a decision. In Old Testament Israel, witchcraft was a crime punishable by death (Exodus 22:18; Leviticus 19:31; 20:6, 27). The New Testament teaching about the occult is clear. Acts 8:9-24, the story of Simon, shows that occultism and Christianity don’t mix. The account of Elymas the sorcerer in Acts 13:6-11 reveals that sorcery is violently opposed to Christianity. Paul called Elymas a child of the devil, an enemy of righteousness and a perverter of the ways of God. In Acts 16, at Philippi, a fortune-telling girl lost her demon powers when the evil spirit was cast out by Paul. The interesting matter here is that Paul refused to allow even good statements to come from a demon-influenced person. Acts 19 shows new converts who have abruptly broken with their former occultism by confessing, showing their evil deeds, bringing their magic paraphernalia, and burning it before everyone (Acts 19:19). Thank you, I really enjoyed this post. I personally have a hard time with Halloween as an ex-witch. This is a difficult time of year for me. (I have a three part post on this on my blog). My husband sees it as purely secular fun, so I've submitted to his leading and our kids are allowed to do the non-scary costumes and such, and I do not have to participate, which is a relief to me. I can tell you, I'll feel so much better when tomorrow dawns. I feel that Halloween is a part of our culture and hiding our children away from it isn't feasible. They will have friends who celebrate it and end up feeling left out. It is only natural to rebel when we're told we can't do something and I think acting like Halloween doesn't exist is a recipe for rebellion. I try to put the focus/emphasis of Halloween on celebrating the harvest and beauty of God's creation during this time of the year. I purposely buy only fall decor that I can have up Sept-Nov. I think it's more realistic to redirect how YOUR family celebrates Halloween (fall festivals, fun costumes, candy, pumpkin carving, ect.) vs. hiding them away from the world like Halloween doesn't exist. I believe the bible does speak in regards to things of this nature. 1 Thessalonians 5:22 states "Abstain from all appearance of evil (shrink from it and keep aloof from it in whatever form or whatever kind it may be. )AMPLIFIED BIBLE. It's about standing your ground on your faith and not wavering no matter how cute or innocence it my seem in the natural. In the spirit realm the demonic forces are at it's highest levels. I would not want to expose my son to ANY kind of demonic activity. The demons don't care what kind of costumes you wear as long as you are in agreement with darkness, by wearing a disguise is all it takes. Remember who the Master of Disguise is…Satan himself! Thank You Myra, for speaking out the truth. All holidays (Easter, Thanksgiving, Christmas, Valentine's Day, etc) have pagan origins, as do birthdays (originally for zodiac purposes). 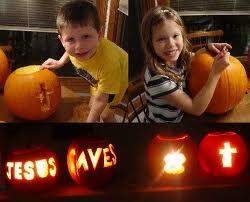 If you're going to avoid Halloween, you should avoid everything except the feasts and such outlined in the Bible. AMEN! Your response is dead on. As believers we do need to ABSTAIN from ALL appearances of evil. Being a committed follower of Chris means that sometimes, you will have to make a stand. Buy your kids candy on ANY other day your kid will learn how to stand for Christ and not conform to the ways of the world. If you think you shouldn't hide your kids from halloween cause that is some kind of "default" thing people do than you shouldn't hide them fromd drugs or things like that. If they ask will you give them just to try so they don't feel left out? So they dont rebell? Well said Myra. I totally agree.